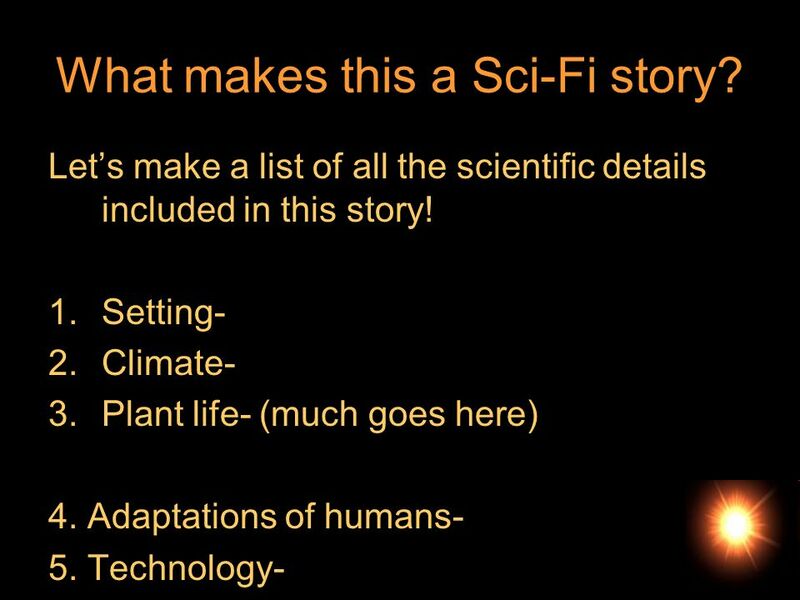 2 What makes this a Sci-Fi story? 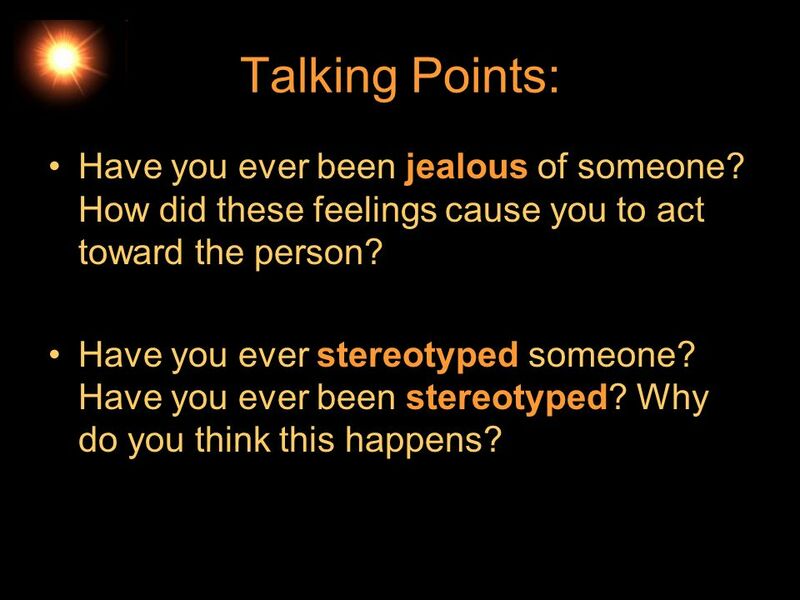 3 Talking Points: Have you ever been jealous of someone? How did these feelings cause you to act toward the person? Have you ever stereotyped someone? Have you ever been stereotyped? Why do you think this happens? 5 Who’s Who? 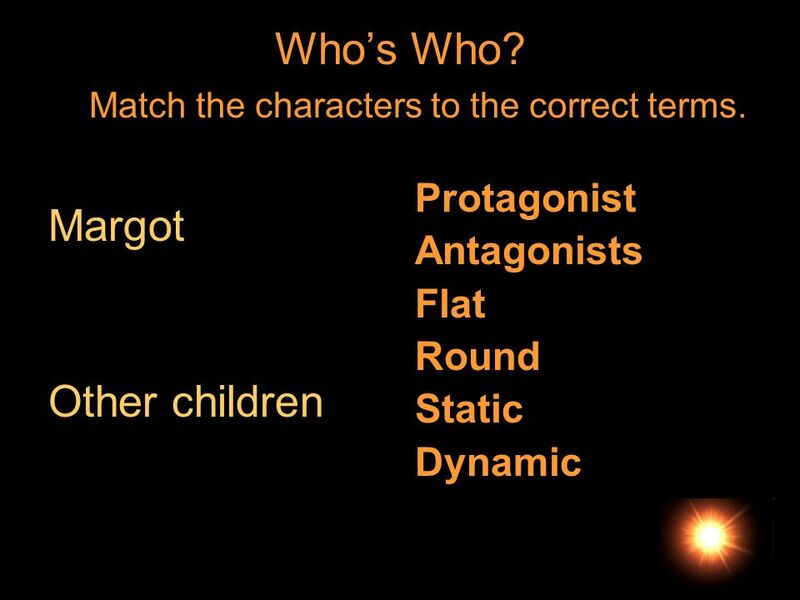 Match the characters to the correct terms. Direct Characterization: an author states what traits the character possesses. Ex. Johnny is nervous around girls. 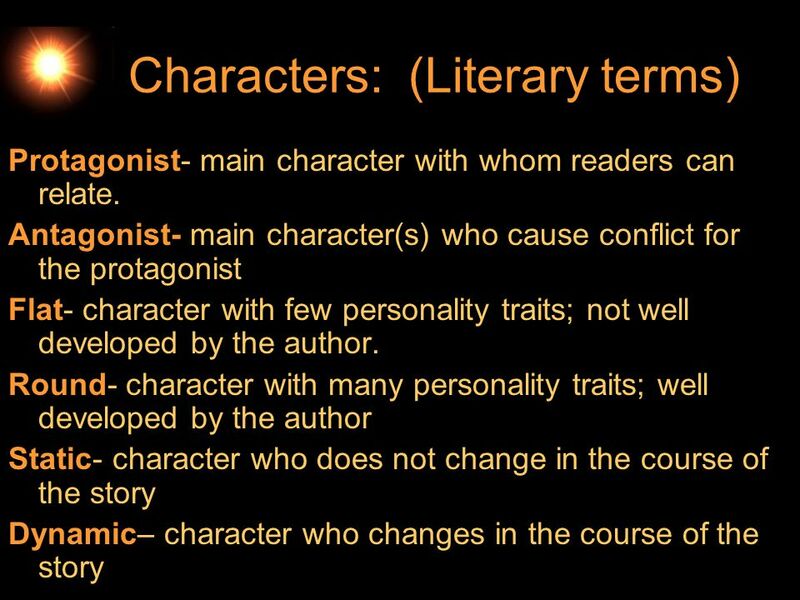 Indirect characterization: the reader must infer what traits a character possesses. Ex. 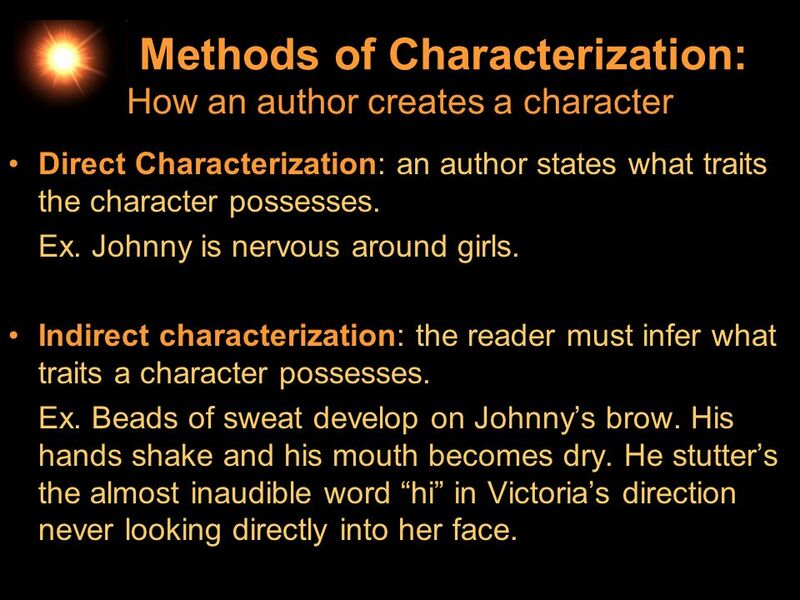 Beads of sweat develop on Johnny’s brow. His hands shake and his mouth becomes dry. He stutter’s the almost inaudible word “hi” in Victoria’s direction never looking directly into her face. 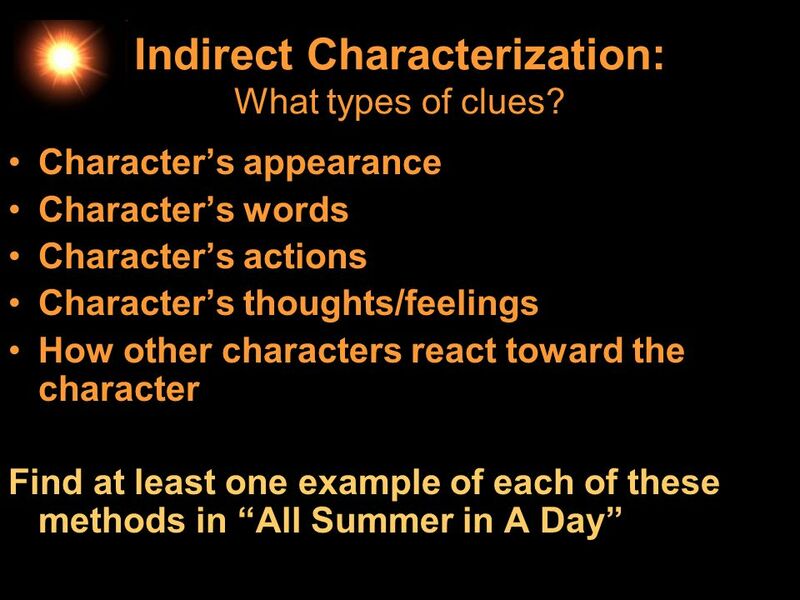 7 Indirect Characterization: What types of clues? 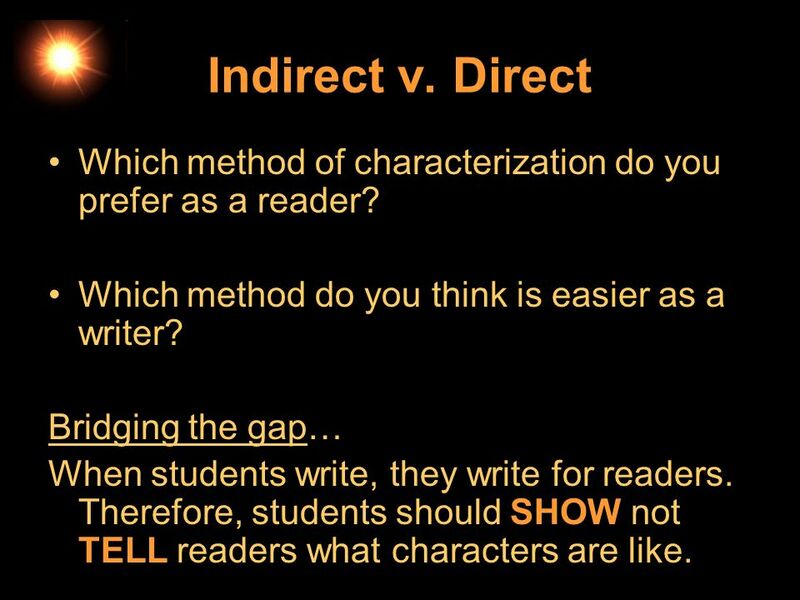 8 Indirect v. Direct Which method of characterization do you prefer as a reader? Which method do you think is easier as a writer? Bridging the gap… When students write, they write for readers. Therefore, students should SHOW not TELL readers what characters are like. 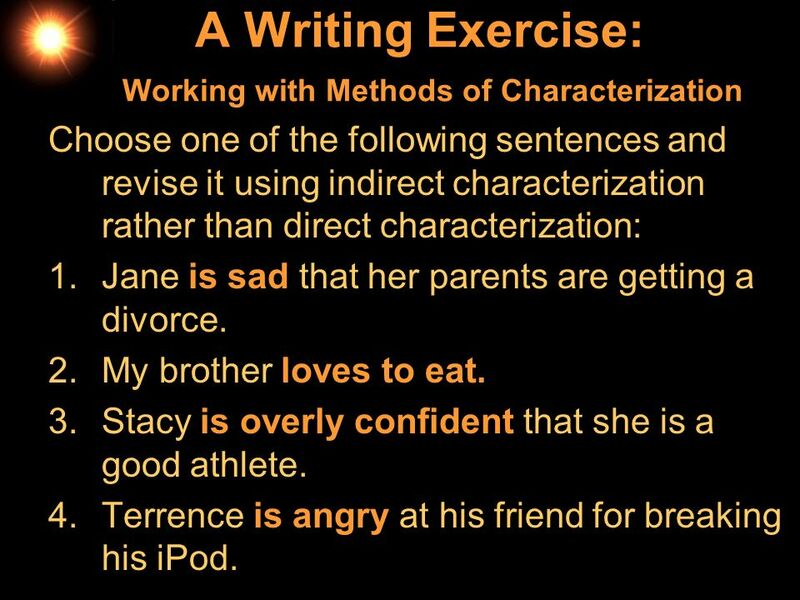 Choose one of the following sentences and revise it using indirect characterization rather than direct characterization: Jane is sad that her parents are getting a divorce. My brother loves to eat. Stacy is overly confident that she is a good athlete. Terrence is angry at his friend for breaking his iPod. Johnny is nervous around girls. 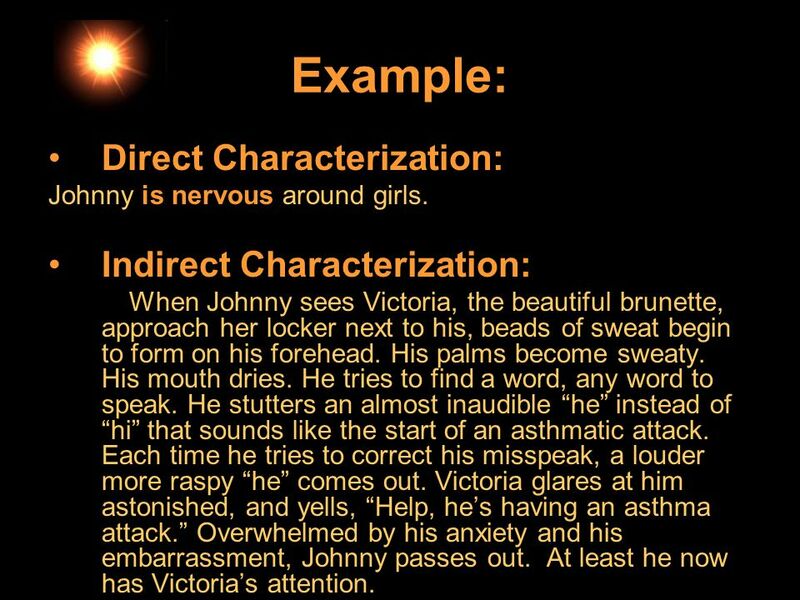 Indirect Characterization: When Johnny sees Victoria, the beautiful brunette, approach her locker next to his, beads of sweat begin to form on his forehead. His palms become sweaty. His mouth dries. He tries to find a word, any word to speak. He stutters an almost inaudible “he” instead of “hi” that sounds like the start of an asthmatic attack. Each time he tries to correct his misspeak, a louder more raspy “he” comes out. Victoria glares at him astonished, and yells, “Help, he’s having an asthma attack.” Overwhelmed by his anxiety and his embarrassment, Johnny passes out. At least he now has Victoria’s attention. 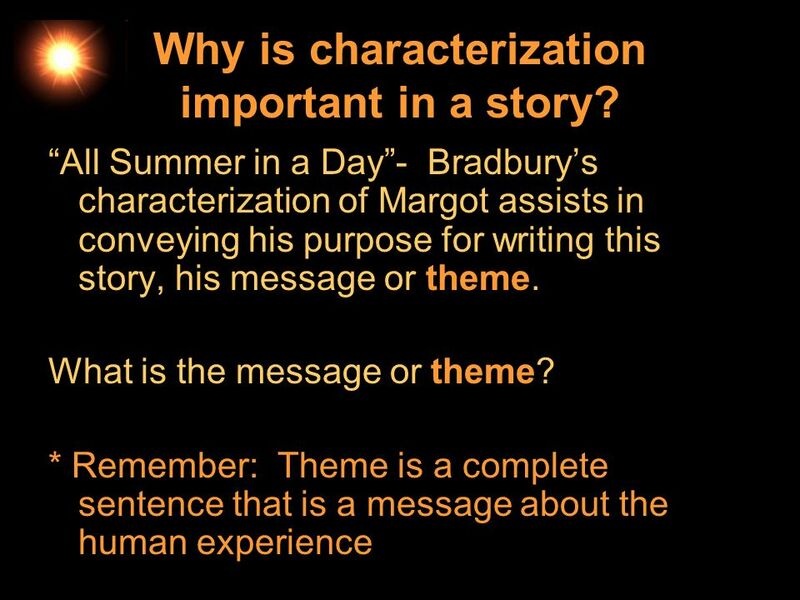 11 Why is characterization important in a story? Born in 1920 and is still alive and writing! Published The Martian Chronicles in 1950 and became an established science-fiction writer. 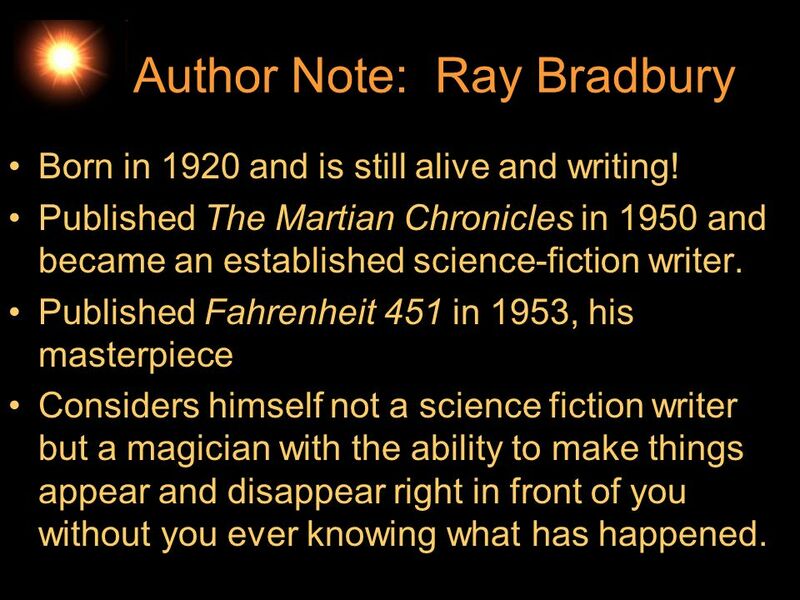 Published Fahrenheit 451 in 1953, his masterpiece Considers himself not a science fiction writer but a magician with the ability to make things appear and disappear right in front of you without you ever knowing what has happened. 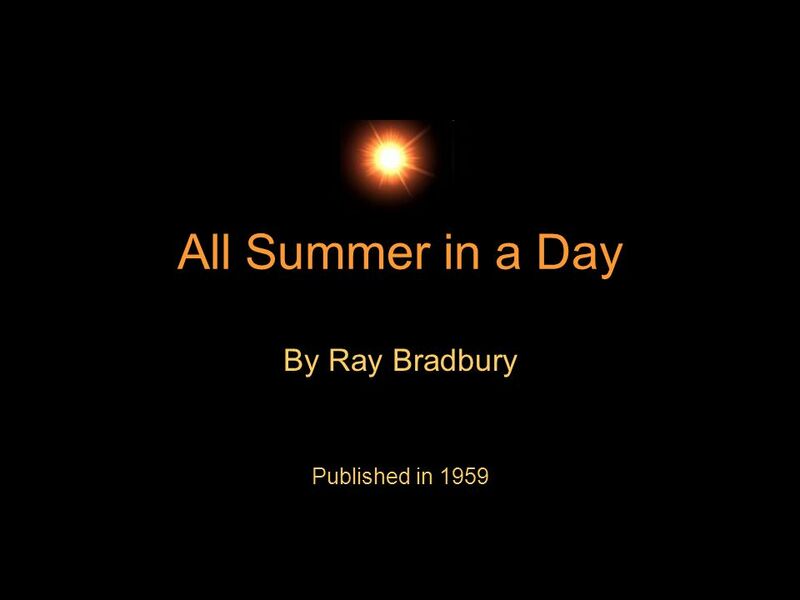 Download ppt "By Ray Bradbury Published in 1959"
Characterization in Literature Humorous Angry Compassionate Vengeful Sad Happy Lazy Energetic. Characterization Notes. characterizationthe way a writer creates the personality of a character. When a writer will simply tell readers that a character. Ch. 2 Characters: The People You’ll Meet. What are Characters? People or animals in a story Ex: Ron Weasly in Harry Potter Margot in All Summer in a Day. Symbolism Characterization Literary Elements Theme Setting. Elements of a Short Story Or What makes a short story? Elements of Fiction Plot Theme Setting Characterization Point of View. Literary Terms for Narrative Audience the people for whom a piece of writing is intended. Agenda 8/25/14 * I can identify direct & indirect characterization. 1. Bellringer *Reread your bellringer from Friday. Make a prediction about what is. Short Story Elements and Terms. A short story is … a brief fictional narrative in prose Sometimes only a few pages in length!